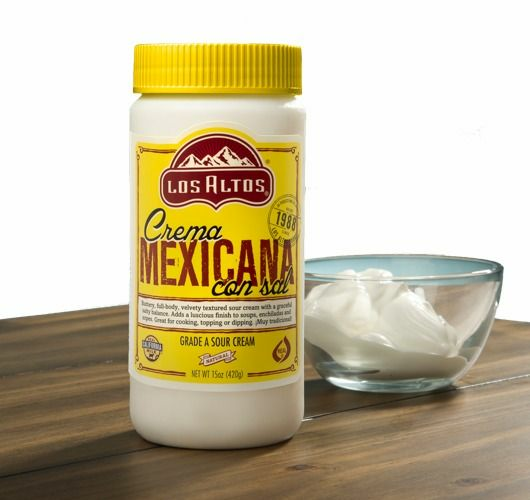 Los Altos Crema Mexicana Con Sal is a full-body, velvety textured sour cream. Its flavor tends to notes of butter and cultured cream and end with a graceful salty balance. Crema Mexicana Con Sal is great as a topping to enchiladas and sopes or adds a luscious finish to sauces and soups. La crema mexicana con sal marca Los Altos es una crema procesada de forma natural.Los Altos Foods fue la primera empresa en introducirla a los Estados Unidos, solamente se utiliza crema pasteurizada de grado "A" sin ning�n conservador o estabilizador artificial. La consistencia es rica y cremosa. Pru�bela en tacos, tostadas, burritos, enchiladas, o en cualquier otro platillo mexicano. Tambi�n es deliciosa en postres como fresas, pl�tanos o con cualquier otra fruta. When I moved to the US, I lost my liking for cream, because I was so spoiled in Mexico with our crema. It just didn't taste the same here. Until I found this cream from Los Altos, I've noticed that I've started to ad cream back into my recipes, over enfrijoladas, enchiladas, tacos. This is the crema I recall from Mexico, thanks Los Altos!! I like a big bowl of piping hot pozole on a cold day up here in Oregon. But pozole is no good without the garnish and the sides. Back home, I ate it with tostadas topped with crema. This crema is lightly salted and has a smooth, creamy texture. No additives to make it thinker. Just the great taste and feel of a natural crema on my tostadas. I also like it on taquitos and enchiladas. It brings out all of the great flavors that I enjoy most.